I broke my MANTIS. and would like to get it flying again. Does anyone know where I can get Sky Shark rods and ferrules in the Toronto area? Nothing against the host store but shipping to Canada is crazy. I emailed Ken at BMK and he suggested I look local because the cost to my door would be around 30 bucks for the one rod! Ken did suggest someone in Québec who I have emailed. When buying replacement spars, I always buy 6 of each item. That way the shipping cost is divided over all the sticks. After a while, you have a good stash of spars for future breaks. OK John, you're scaring me. I only started flying late last summer. I only have 2 stunt kites and an Aerobe. The last thing I want to do is break stuff. Breaking a knock… ok. I did get an extra pair with the MANTIS and I did buy another set from Steve for my Quantum, but 6 of each . That’s just crazy talk. Next thing you know, you will be telling me to buy lighter rods to turn my BMK into a UL! That’s just crazy talk. Next thing you know, you will be telling me to buy lighter rods to turn my BMK into a UL! You haven't?!? well, no wonder!! A one pound package can ship as cheaply as $5.00 ... of course it is first class mail and length / size restrictions apply but it would work on a small handful of rods ... just an option in case you can't buy locally. There is also the Great Canadian Kite Co. and there is Tail Spin Kites ,82 Huron Rd, Mitchell, ON (not sure if they will have Skyshark Rods). Other than that, about a 3 hour trip across the border to Kites and Fun Things,1049 South Mail St, Plymouth, MI ,48170. Other than that, about a 3 hour trip across the border to Kites and Fun Things,1049 South Mail St, Plymouth, MI ,48170. Uh, isn't that the manufacturers address? Thanks Tempest, I'll try the other places you suggested. If I can't come up with anything in Canada, I'll let you know. Yes it is, but it is also a kite shop. Is that right Steve, the cost is only $5 to ship to Ontario, i am interested in getting a few spars as well? The last thing I want to do is break stuff. Think again. Avoiding breaking stuff makes kite flying less fun and steepens the learning curve considerably. 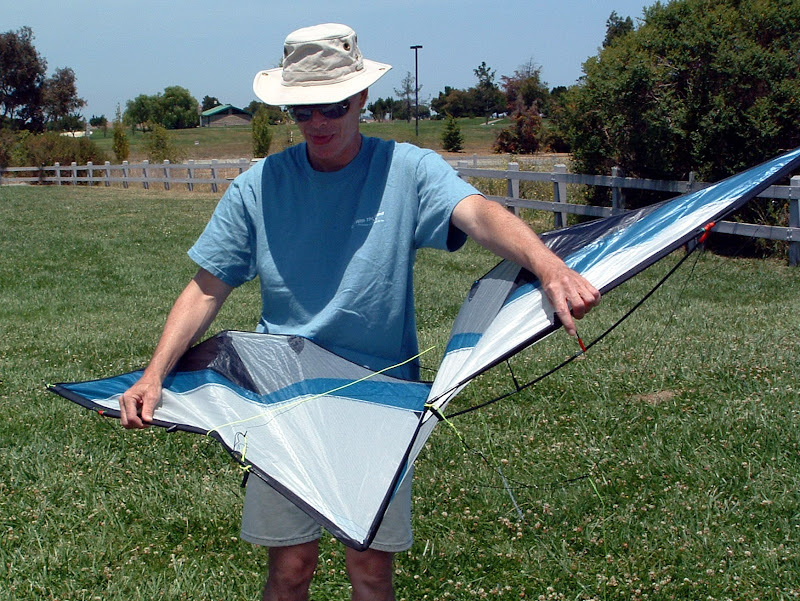 Breaking kite sticks isn't a matter of IF, but When, so having a few spare parts on hand will keep you flying. I don't know about 6 when you're just starting out, but a spare or two makes sense. I broke more sticks in the first two years of flying than in the last ten, so it does become less of an issue over time. Unless you are working on stuff that breaks kites, then it goes back up.. This photo just never gets old: (Jim Byrne (my favorite kite model) practicing his submission hold on the C21 Extreme.